In preparing to write this article I reflected on what it means to try and find a “cure” for something as debilitating/devastating as a (terminal) disease, Parkinson’s, Cancer, Alzheimer’s, Senile Dementia, Gulf War Syndrome, Autism – the list seems endless. “Cure” in Standard English would mean to heal, treat, make well, restore to health or alleviate. In this article, however, I wish to explore deeper and more profound meanings of the word to cure. in Latin, meant to cure, or take care of, or to prepare. in the French, “curer”, means to cleanse. In Italian the root means to care, give diligence, to cure, attend, protect (also to value or esteem). Spanish is very workman-like in its approach to meaning: “cura, curar, curiso” means to cure, a remedy, guardianship, to administer medicines, to salt (as meat), to season (as timber), to bleach thread or linen (implying a chemical process), but it also connects with overtones of psycho-aesthetics – meaning curious, neat, clean, handsome, fine and careful. What an interesting concoction of meanings the word conjures up! It opened up new vistas as to the role of the physician or therapist, and as to what is implied when one is to cure someone of an affliction, disease or illness. CURE: To heal, as a person diseased or a wounded limb, to restore to health, as the body, or to soundness, as a limb. A healing, the act of healing, restoration to health from disease, and to soundness from a wound. We say medicine can effect a cure. Remedy for disease, restorative; that which heals. To subdue, remove, destroy or put to an end to; to heal, as a disease. To dry; to prepare for preservation, as to cure hay, or prepare salt, so as to prevent speedy putrefaction. My purpose with the first article is to describe the Basal Ganglia, its neuro-anatomy and physiology and to discover why diseases of this sub-system of the human brain leads to such devastating disease conditions. I wish to focus on both the anatomical and physiological qualities of the Basal Ganglia, on the diseases, which ravage this sub-system of the brains of millions of individuals, I will also show what “cure” might be expected if the root causes are addressed, which may be helpful in preserving its life-sustaining functions. In the second article, I will show, how, having an understanding of its anatomy and physiology and “cortical software re-use”3 principles, one can hope to re-pattern and re-activate the Basal Ganglia by means of Sensory-motor pathway stimulation. When a person or child is sick and suffering from an extremity, a disease that robs one of self-worth, vitality, communication, independence, sanity and ultimately life itself, the anguish this brings drives carers, parents, professionals and self to seek a cure, something which will restore the lost health, vitality and the former sense of well-being. In order to understand how damage or impairment of the Basal Ganglia may imprison the sufferer’s consciousness, communication, reason, movement, memory, mood and rhythm of self, I would like to give a brief overview of the neuro-anatomy of this structure as structure always underlies function as it displays such interrelated neurological complexity. The Basal Ganglia is made up of a number of sub-cortical structures, that includes the caudate and putamen, segments of the globus pallidum, the pars reticulate, and finally the compacta of the substantia nigra, as well as the sub-thalamic nucleus. The Basal Ganglia, just like the cortices, consists of two parts – a left and a right ganglion. The Basal Ganglia roughly has two “departments’ – one which receives information and one which dispatches information. The receiving department is the neo-striatum and this area is informed by the entire cortex (“thinking cap”) as well as that which is about to be passed into consciousness by the intra-laminar nuclei of the thalamus (central relay station for all sensations excluding smell and taste). The main dispatching department consists of the globus pallidus and substantia nigra. Interestingly enough, some of these projections from the two named areas go back into the thalamic region [where the information is emotionally charged], before being projected upwards into the cortex of a person or downwards to the brainstem, via the sub-thalamic nuclei. Most of the Basal Ganglia’s activity, however, is structurally streamed in an ever-ascending direction – either directly from the substantia nigra to the neo-striatum, or to the globus pallidum, then to the thalamus, on its way back to the neo-striatum, before emergence in the cerebral cortices. What struck me in studying this system is not merely its complexity (loops-within-loops, parallel systems which intertwine and feed-back on themselves in splendid self-modulation) but how all that happens here is strongly informed by sensation – as Barker4 states: “Neuro-psychologically, the Basal Ganglia take highly processed sensory information and converts it into some kind of motor programme” (emphasis mine). It is then taken through to higher levels of reasoning, planning, evaluation, decision-making, inhibition, throughout being modulated by a cocktail of neuro-chemicals (glutamine, GABA, dopamine) and finally filtered back into the Basal Ganglia. Here a motor package is prepared [or a non-motor response is generated (mainly involving visual reasoning / acts)], by which time the action (impulse) has become gloriously multi-dimensional, exactly trimmed, carefully edited, pedantically planned, then poured through an emotional grid, time-stamped, speed-regulated and fine-tuned, so that frame-by-frame “freeze”-shots, are blended into a real-time movie-like flow. The end result is like listening to and watching a symphony being played by a philharmonic orchestra, which blends in exquisite harmony, compounding (emotional) energy and skill and it is regulated by a split-second orchestrated impetus, towards that which is smooth, melodious and proficient, which Luria5 termed – a “kinetic melody” – in referring to a person’s signature on paper. Using music as an exemplar of Basal Ganglia function isn’t arbitrary. The Basal Ganglia is not only activated by, but functions as if by the energy of a musical score. No wonder, Sacks6 alludes to the power of music as both the agent of cure and the allegorical “release agent” of movement in the Parkinson’s sufferer, stating: “The power of music (can) integrate and cure,… liberate the Parkinsonian and give him freedom while it lasts (‘You are the music/while the music lasts,’ T.S. Eliot), is quite fundamental…”. Later he adds in his book Awakenings7, speaking of a patient who suffered from encephalitis lethargica and who emerged for a while after being administered L-Dopa, that: Music serves to arouse her own quickness, her living-and-moving identity and will, which is otherwise dormant for so much of the time.” He stressed that a kind of “rhythmic impetus” has to be present, but that this has to be “embedded in melody. Raw overpowering rhythm, which cannot be so embedded, causes pathological jerking; it coerces instead of freeing the patient, and thus has an anti-musical effect”. There are many sufferers who have had insults to the Basal Ganglia: Parkinson’s-, Alzheimer’s-, Encephalitis Lethargica-, old age-, brain injury-, Gulf-War veterans and many other less obvious categories of sufferers. In this article I will focus on one such group that deserves attention – the Gulf-War Veterans and link this group and their dysfunction to the developmental enigma of autism. I am vicariously reminded of an article on findings published by a UT Southwestern Medical Center at Dallas study, published in the American Medical Association’s Archives of Neurology11 , which linked brain cell loss in the left basal ganglia of sick Gulf War veterans with out-of-control production of a brain neurotransmitter chemical called dopamine. “With injury to the brain cells that normally control dopamine production, the cells at first go wild, overproducing dopamine,” said Dr. Frederick Petty, a UT Southwestern professor of psychiatry and staff psychiatrist at the Dallas Veterans Affairs Medical Center. He indicated that over time these over-stimulated cells might wear out and die, causing degenerative brain diseases. The first group were classified as having impaired cognition (thinking, communication and socialisation impaired) – that means that the processes from the Basal Ganglia into the pre-frontal and frontal cortices were affected. The second group were classed as having had confusion-ataxias (movement impaired). This group would have the motor projections of the Basal Ganglia most severely affected. The final group suffered severe, debilitating and prolonged pain (sensation impaired), and it is my understanding that the processes to the thalamus would be most significantly impacted in this group, as thalamic syndrome is a condition where one can’t process pain until it suddenly becomes over-whelming and so intense that it causes extreme trauma. Gulf War Syndrome Veterans – Group 1 – impaired cognition: They wore pesticide-containing flea collars (endocrine disrupters)12,13. Group 2 – confusion ataxias: They were exposed to low-level nerve gas and experienced side effects from anti-nerve gas, or pyridostigmine bromide (PB), tablets (suppression of/or destruction of birth-sites for catecholemines such as dopamine). Group 3 – prolonged pain sensitivity: wore insect repellent with high concentrations of DEET and experienced side effects from the PB tablets (as above – VOC’s destroy nerve cells). My own exploratory observations into the aetiologies of autism, led me to see some interesting parallels. 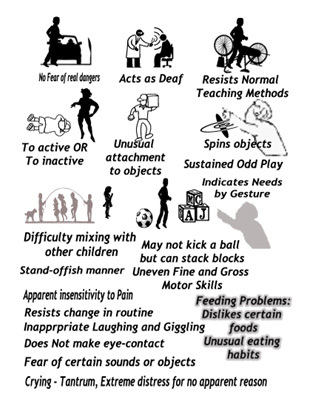 Autistic children are diagnosed by means of a triad of impairment, affecting communication (cognition), movement (apraxias/dyspraxias) and stereotypical behaviours (self-stimulatory – often due to disturbed sensory hungers – sensation impaired). My own exploratory observations into the aetiologies of autism, led me to see some interesting parallels. Autistic children are diagnosed by means of a triad of impairment, affecting communication (cognition), movement (apraxias/dyspraxias) and stereotypical behaviours (self-stimulatory – often due to disturbed sensory hungers – sensation impaired). Many autistic individuals (as also seen in Gulf-War Syndrome sufferers – GWSS’s), struggle with severe cognitive issues, have major dyspraxias, dysarthias, apraxias, whilst some are ataxic and there are those who experience all of the above, but have their condition exacerbated by hyper- (or hypo) sensitivity to sound, smell, taste, light, touch, pain, etc. The connection is clear, at least to me, that system breakdown for both GWSS’s and Autistic individuals may be identical, i.e. I wish to infer that the same elements of damage/dys-regulation which have been detected in Gulf War Syndrome sufferers, may also be wreaking havoc in the brains of autistic individuals. Now that we have explicit proof14 that there is neuronal loss in the brains of the GWSS’s, can we not infer that autistic individuals may be dys-regulated for the same reason? Whether subtle or explicit damage, I believe that the “cure” of Autistic individuals would lie in the same place where we would find a “cure” for GWSS’s. Having said that, I propose that toxicity issues drive both conditions. The “disappearance” from normal of an autistic individual one fair day in their first, second or third year of life, may have more to do with a bio-chemical or neuro-immunological insult of the Basal Ganglia, than what it has to do with purported psychological harm done by a frigid parent or pre-birth rejection of the unborn child by a mother faced with an unwanted pregnancy! Do I have any facts in corroboration of my hypothesis? I certainly do! Since 2000 our Institute, Synapse Africa Brain Dynamics Clinic, has been sending urine samples to the Paediatric Research Institute in Oslo, Norway, to one of the world’s foremost researchers in protein peptide research, Dr. Kalle Reichelt – to date more than 400 samples have been initiated by our Institute. These urine samples were sent to detect whether children with autism and a variety of other learning disabilities, such as late onset of speech (motor), stuttering (motor), oral dyspraxias (motor), dyslexia (cognitive), visual-motor learning disabilities (motor), sensory integration disorders, such as hyper-acute hearing, touch defensiveness, etc. (sensory), which have taken their toll on emotion, communication, socialisation and cognition, may have any roots in the excess opioid theory of Jaak Panksep, researcher in the late 1970’s who postulated that autistic individuals had raised opiate levels in their brains. The sample results consistently and conclusively support that virtually every, single autistic child ever tested, plus a large percentage of learning disabled, attention deficit, behaviourally, sensory and cognitively dys-regulated individuals, show remarkably high levels of opioid peptides in their urine (gluta-morphines, caso-morphines and gliadino-morphines) [mal-digested protein due to enzyme deficiencies]. These opioids dys-regulate the normal neuro-chemistry of the brain and particularly in the basal ganglia’s substantia nigra. The opioids have a drug-like effect and are designed to perform neural pruning (excessively zealous pruning when apoptosis – [programmed cell death] should have been concluded, opioids prolong the process of programmed cell death, beyond that which is desirable!). disruption of almost all detoxification pathways in the human body, as well as on digestion, due to the effect that these toxic elements have on the body’s enzymes that regulate life processes. Of late (2003 – 2010) our Institute, has also been instrumental in having mineral hair analyses16 done on the hair of children with autism and those with developmental delays and learning disabilities plus on adults with a variety of psycho-social and emotional problems (also seen in GWSS’s). The results support that the population of autistic, LD, ADD and behaviourally/emotionally dys-regulated individuals consistently show evidence of the presence of potentially toxic elements, lead, aluminium, mercury, cadmium, antimony, nickel, uranium, etc. The last marker for toxicity in autism, which I offer in corroboration of my hypothesis that there is a distinct parallel between those who suffer with GWS and autistic individuals, can be traced when studying micro-organism organic acids as toxicity producing agents in the human body. Our Institute has carefully looked at the work of Dr. William Shaw17. He offers evidence that autism and other syndromes, which are present as developmental delays, may be caused by myco-toxins from microbes, such as Candida, and bacteria, such as Clostridia. The former give off organic acids which are both neuro-toxic and muscle toxic (tartaric acid, citramalic); they also seem to be implicated in the formulation of arabinose in the body, a sugar, which only occurs in people who are seriously colonized by colonies of yeasts. Elevated protein-bound arabinose has also been detected in the serum proteins of schizophrenic individuals, in children with behavioural problems, such as conduct disorder and Dr. Shaw18 believes that arabinose may affect biochemical processes in autism as well as other diseases. Arabinose, for example, causes pentosidines which lead to neuro-fibrillary tangles in the brains of Alzheimer patients. One of the times when yeasts and fungi proliferate at exponential rates is when the body is subjected to (high/repeated) doses of antibiotics, where good flora is destroyed in the GI tract and toxicity-producing micro-organisms can overgrow unchecked (dys-biosis). There is once again a parallel between those with Gulf War Syndrome and those with Autism: both show significant cognitive, sensory and motor problems, so debilitating that some actually die. Both show exposure to toxins (whatever those toxins may be) and an auto-immune breakdown reflecting a breech in the body’s immune response to foreign invaders, as well as an inability to detoxify and to maintain vitality. Gulf War Syndrome sufferers were fed a cocktail of several vaccinations and chemical warfare “protective” agents, which some19 say were intended to be a human experiment. [There is an issue of ethics and a question whether there shouldn’t be criminal culpability on the side of the USDoD as these soldiers had not volunteered to be subjected to these chemical insults, but were ordered to submit to procedures that violate the vitality of their persons – not central to this discussion though!]. Defence Department funded research into the neurological status of these Veterans revealed that the most likely sites for brain injury would be the Basal Ganglia neurons and it took its toll on dopamine production because the symptoms of Gulf War syndrome strongly resemble early symptoms of well-studied degenerative diseases of the basal ganglia like Huntington’s, Parkinson’s, Wilson’s and Fahr’s diseases. Typical symptoms of Gulf War syndrome include chronic fatigue, dizziness and attacks of vertigo, general body pain, attention and concentration problems, personality changes, depression, and tremor21. A final comment on the parallels between Gulf War Syndrome Veterans and autistic individuals is that a routine organic acid screening test run by Dr. Shaw’s laboratory in the USA, frequently shows elevated urine levels of homovanillic acid in autistic children – twice the upper level which constitutes normal. This too could be due to the disruption that micro-organisms, such as Candida and Clostridia, cause in the body’s bio-chemical regulation in autistic individuals. Catecholemine-secreting tumours can be responsible for excessively high levels of HVA, as can a disruption/destruction in the Dopaminergic pathways in the Basal Ganglia due to chemical damage to these pathways. The Gulf War Veterans who showed a 9% destruction of the cells in the Left Basal Ganglia on proton magnetic resonance spectroscopy, with significant damage to the dopamine production centre (substantia nigra) in a lateralised pattern, giving rise to elevated levels of HVA (homovanillic acid) – which is used to assess central dopamine activity. 5Luria, A. R. (1973). The Working Brain. Basic Books. ISBN 0-465-09208-X. 8Reilly, Ronan, http://cortex.cs.may.ie/research,( 2004) – Cortical Software Re-use. 11Arch Neurol. 2000 Sep; 57(9):1263. 17Shaw, William, M.D., (2002), Biological Treatments for Autism and PDD, p. 36 – 38. 18Shaw, William, M.D., (2002), Biological Treatments for Autism and PDD, p. 36 – 38. 19Scheibner, Viera, PhD, (2000), Behavioural Problems in childhood – The Link to Vaccinations, pp. 96 – 109. 20Scheibner, Viera, PhD, (2000), Behaviouiral Problems in childhood – The Link to Vaccinations, pp. 96 – 109.